The “blaxploitation” subgenre of films that were very popular with audiences (and not just black audiences) in the 1970’s were noteworthy for being among the first movies to afford leading man status to any black actor not named Sidney Poitier. But what’s largely forgotten today, although not by those who saw them (including me as a college student), is that the films were often a heck of a lot of campy over-the-top fun. In 2018, there is no dearth of black leading men, including Dwayne Johnson, who may be the most popular action star today, but there’s always room for the same type of escapist fare. As a result, we get Superfly, a remake of the 1972 genre classic, and the remake manages to easily out-excess the original and, although it occasionally gets bogged down in an overly intricate plot, it generally captures the spirit of the genre. The plot of the new Superfly is much like that of the original (which was actually titled Super Fly). The movie focuses on Youngblood Priest (Trevor Jackson recreating Ron O’Neal’s signature role), a cocaine dealer who takes his chosen business seriously and avoids attracting attention to himself, unlike his main rivals, a brash gang called the Snow Patrol who dress all in white and love to literally throw money around by the hundreds in strip bars. After a run-in with Juju (Kalaan Walker), a lieutenant in the Snow Patrol, results in an innocent bystander being shot, Priest vows to get out of the business after first making one final big score. When his mentor and supplier Scatter (Michael Kenneth Williams) won’t supply him with enough product, Priest goes around Scatter and risks his life cutting a deal with Scatter’s Mexican cartel supplier, Adalberto Gonzalez (Esai Morales). Priest and his crew are able to move most of the cocaine, but they begin to attract some unwanted attention, both from the Snow Patrol and from a couple of crooked cops (Jennifer Morrison and Brian Durkin) who want a piece of Priest’s profits. In addition, Scatter doesn’t take very kindly to being sidelined by Priest. The original Super Fly was filmed on location on the streets of Harlem and depicted the drug traffic as gritty and depressing. Priest dressed well and had his share of bling, but otherwise the film did not showcase any obvious displays of wealth. The new movie moves the action to Atlanta and is all about glitz and excess, beginning with the two nightclubs in which the opening scenes are filmed, locales that could give any Vegas showroom a run for its money. Even more lavish is the Snow Patrol’s headquarters, in the house formerly occupied by world heavyweight champ Evander Holyfield (in real life, not the film). Even Priest, who eschews flashiness, lives in a luxury two-story apartment cleverly hidden inside a rundown factory. The flashiness of the new Superfly goes well beyond the homes, cars, and clothes of the various gangsters. Indeed, the plot is a paean of excess, in which each shootout (and there are several in the movie), turns into a blaze of automatic gunfire, and characters think of highly exotic ways to torture and dispose of each other, including the always popular giving a traitor a lye bath. Trevor Jackson also does Ron O’Neal one better by keeping two girlfriends happy at the same time and in the same shower with him. In keeping with the film’s overall mood, the highly crooked mayor of Atlanta is played by Antwan “Big Boi” Patton of OutKast (who does quite a credible job, as evidenced by the clip below). Amidst all this excess, the film’s director, now known as Director X, and screenwriter Alex Tse had to navigate a somewhat narrow path between total ridiculous campiness (indeed, the Snow Patrol outfits harken back to something out of the Batman television show), and boredom. To their credit, they don’t just pay lip service to the defining qualities of Priest’s character, his cleverness and attempts at a sort of morality. 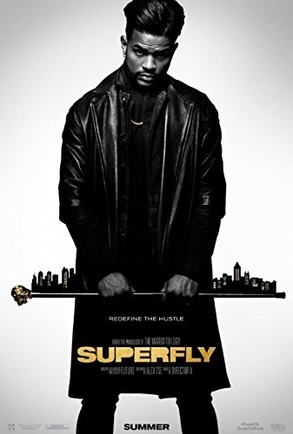 Instead, Superfly devotes a good bit of screen time to showcasing the character of Priest, especially in a lengthy opening sequence in which he confronts an underling who has been holding out on him and manages to defuse a potentially lethal situation without a bit of violence. Later on, when all of Priest’s foes line up against him, his solution is quite clever, worthy of something out of a Steven Soderbergh movie. Unfortunately, the efforts at serious drama in Superfly fall somewhat short of the mark. I suppose it’s possible for a film that features this sort of campy excess practically from beginning to end could hit its serious moments as well, but this movie never manages that. Instead, Priest’s talks with his best friend Scatter, his best friend Eddie (Jason Mitchell), and his primary girlfriend Georgia (Lex Scott Davis) are earnest but ineffective and merely serve to pad the film’s running time. At nearly two hours, Superfly drags at times (the original clocked in at barely over 90 minutes) and could have used about fifteen minutes of judicious editing. However, while Superfly isn’t a traditionally good movie, it’s a good trash movie, with the same excesses that made many of the 70’s blaxploitation films such fun to watch. Although there’s some humor here (including a great bit involving a car chase and a statue of a Confederate general), the movie never becomes ludicrous. Instead, the characters treat the materially seriously and the excesses in character, which makes the movie a lot of fun most of the time. The primary mistake many directors and writers make in this type of movie is to look down at the audience and treat the entire film as a big joke. Here, instead, there’s a conscious effort to update and transpose the original material into the framework of a new century. Superfly isn’t super, but it does fly on a number of occasions. In this clip, Trevor Jackson meets the equally crooked mayor of Atlanta. © 2018 Steven R. Silver. All rights reserved.